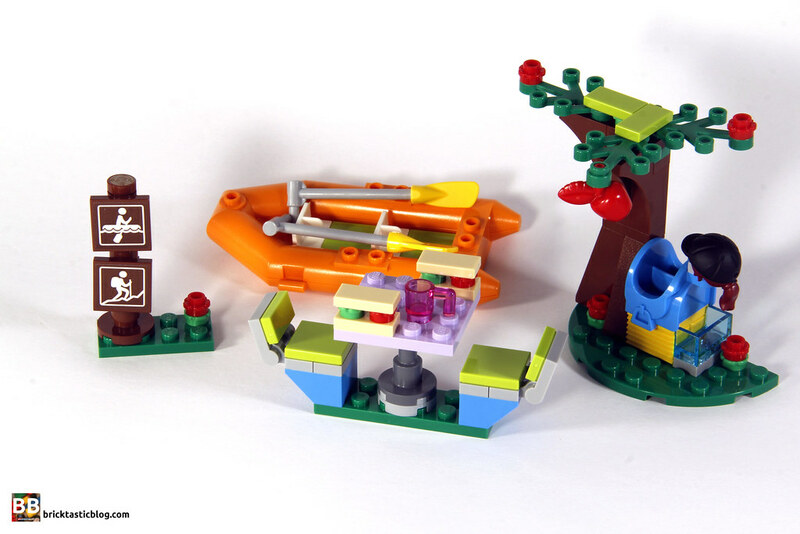 Time for the first review of 2019, and it’s a set from last year that I’ve only just recently gotten around to building! 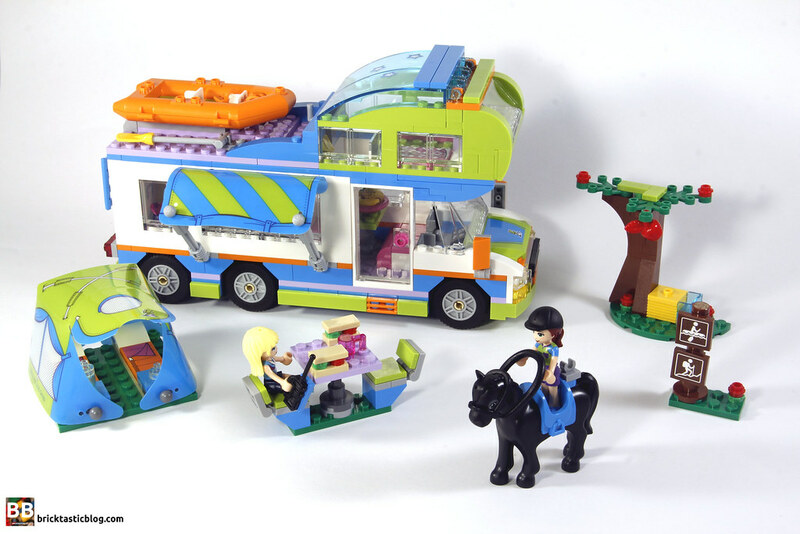 Camping, caravans and campers are nothing new to LEGO – they’ve been creating sets filled with camping minifigures for decades. 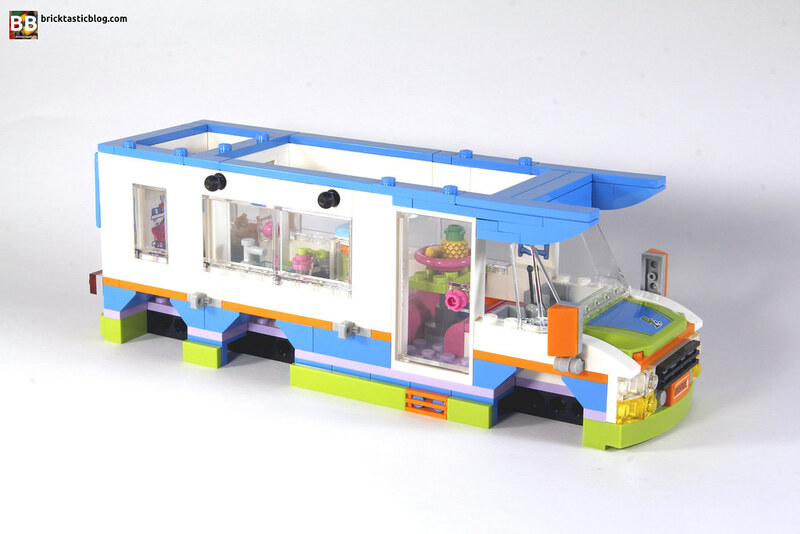 This one, sitting with LEGO Friends, is one of only a small handful of sets from the pastel coloured theme to include a camper or caravan. We’ve seen 41034 Summer Caravan from 2014, and in a similar vein to this one, 3184 Adventure Camper from 2012. How things have changed! 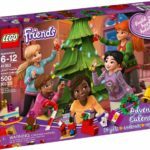 Inside the box you’ll find four numbered bags, a plastic sheet with the tent and awing, some instructions, and a sticker sheet with 16 stickers. There’s a lot, but they’re not too bad. 2018 in Freinds was an interesting year. I’m not a very big collector of Friends sets (I do like the colours though), but for Friends fans, this was the year that the characters changed quite substantially. Mia’s eye colour has changed from brown to green, and Stephanie has remained relatively the same. The same can’t be said for the other Friends, with skin tone also changing in one of them! 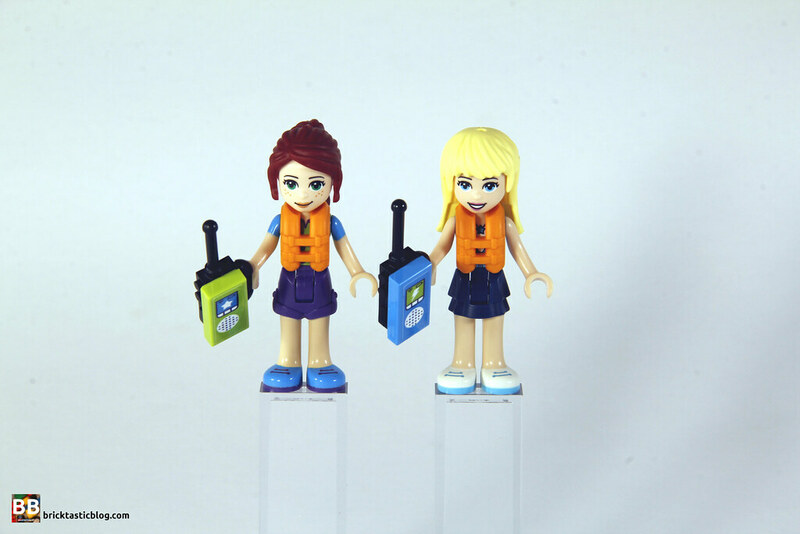 The two minidolls included in 41339 are Mia and Stephanie. The life-jackets are a nice touch. Mia, who owns the camper van (she must have a good job), is wearing purple shorts and a two-toned polo shirt, with blue lace-up shoes. Stephanie has a multi-layered pleated skirt, with a zip up sleeveless jacket and blue and white lace-up shoes. The minidoll hairpieces (there’s three of them – an extra one with a riding hat for Mia), are all made from the rubbery material, and while they look great, they do tend to fall off a little easier. There’s less clutch power with these elements, as they are slightly flexible. There are some nice colours in this set – the bright yellowish green and dark azure look full on, but they work really well together. 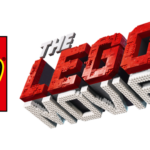 The 1×8 tiles in these colours are exclusive to the set, as well as the 1x2x2 corner tile, and the 1×6 bowed brick. 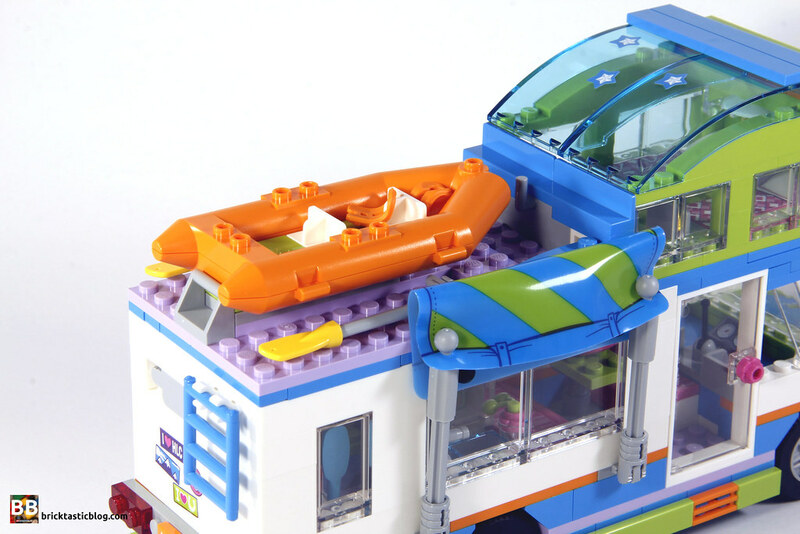 There’s actually a great number of elements in 41339 that are unique or very hard to come by in other sets. I particularly like the tent, and the horse is quite nice too (although the minidolls clearly don’t know how to ride a horse). The bridle is an interesting element as well. I’m not sure it’s kid friendly though. I had a bit of a hard time putting it on the horse, and it seemed to cover it’s eyes. There’s a smattering of different elements that are nice to haves – food and beauty options in the back of the camper van, plus a lot of windows in different shapes and sizes. What I particularly was impressed by though, was the stickers. I’ll get into those in a moment. This is a fun little set to play with! I gave it to a friend’s son to play with the other day and he was suitably impressed. This was even before I opened up the side door. When I did that, his eyes lit up! There’s plenty of room to access the inside of the camper van, with both sections of roof lifting off and the wall opening up. The tent is a great little addition, as well as the horse and seating. The little guy was playing with this set for a fair while, and loved it. He even mentioned well before he started playing with it that he wasn’t really a fan of the Friends sets. To me, that’s a winner. The first of the four bags creates the satellite builds – the table and chairs, the tree, the sign, and the tent. They come together quickly and look great. There’s not a great deal of difficulty to the smaller sections of the build. The second bag is reserved for the first part of the camper van – the chassis bed. There’s not a lot at all to the build. For the most part, it’s bricks on bricks. After the completion of the second bag, it looks a bit like a technicolour nightmare, but it does improve with the next bag. 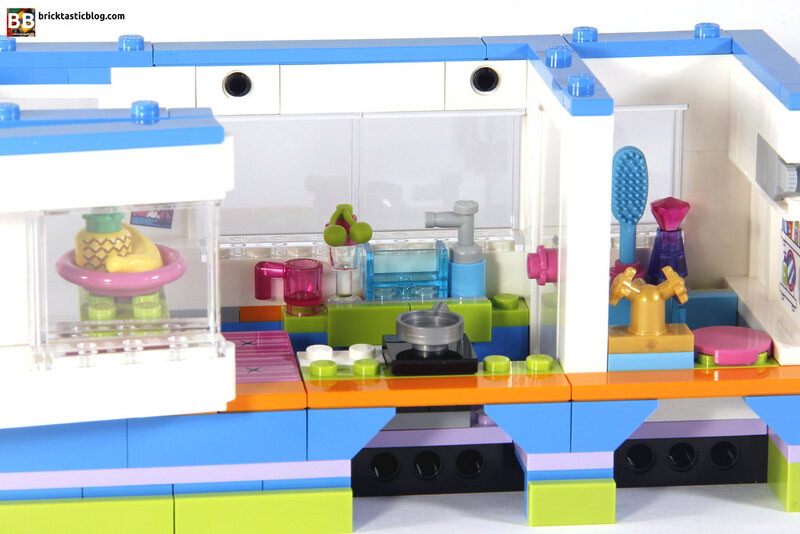 Walls, windows and doors are added, as well as many interior details, such as the bathroom and kitchen space, and the living quarters on the lower floor. The final bag contains the parts for the roof and upper deck. I really like the upper deck section. One thing is missing though – a ladder to get to it! There’s a ladder to get to the boat from the back, but not from the inside of the van. Aside from that, the build is enjoyable, especially for young Friends fans. It’s simple and not repetitive. Now, I’m not usually a fan of stickers, but I have to be honest, these are pretty great! My favourite ones were the bed prints. There are two styles that fit on a 2×4 tile – beds in the top of the camper van, and sleeping bags in the tent. It’s nice having four beds available, but there’s only two minidolls included! Maybe they’ll have some friends over? Maybe Stephanie snores and she needs to in the tent? Who knows. Either way, its a nice inclusion. I also like the difference in bed styles. The sleeping bag stickers in particular look superb. I’m very happy with the sticker inclusions in this set. It’s worth getting them on as straight as possible. 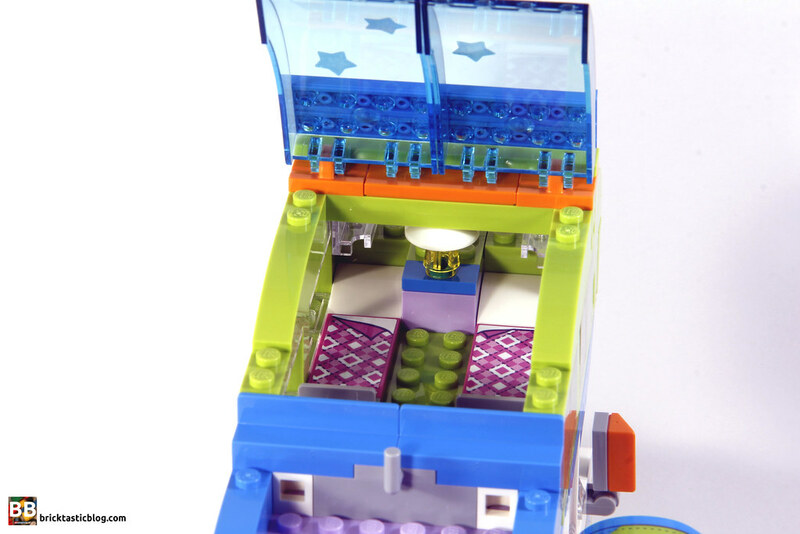 There’s a lot of detail in the interior of the van, without making it look too cluttered. I’m still not a fan of the chairs in the front of the camper, but as the minidolls have studless bottoms, there’s no choice. The smaller builds that go with it are of high quality, but simple. The sign in particular will prove to be extremely versatile. The tent is striking and easy to use, with a lot of detail inside it, again, without being too cluttered. I also like the tree. There has to be a bit of give and take when it comes to aesthetics with a tree this size, but the inclusion of the stack of hay and water trough is excellent. Where this set gets odd is when a minidoll rides the horse. With a regular LEGO system horse it makes sense having this style of riding system, where the minifigure sits in a slot cut out. 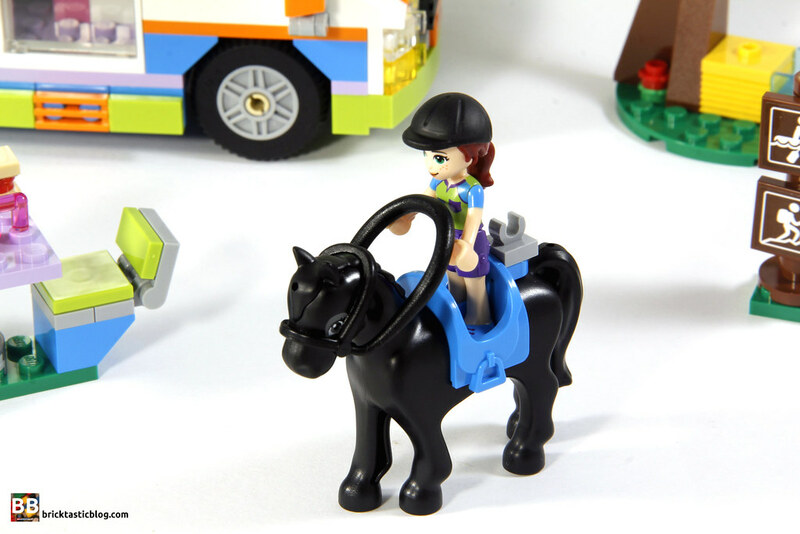 The system horses have straight sides, so it still looks like the minifigure is riding it like usual. The Friends horse is a different matter. It’s rounded, which means the saddle needs to be wider. This leads to a minifigure appearing to only stand on the saddle, and not sit. I don’t know how the saddle can be improved without adding studs to the bottoms of the minidolls, but it looks very strange. At face value, this seems like not a lot for a set at the higher end of the price scale, especially if you’ve got the budget akin to that of the target market. What you get for it may seem a little lacking, but the play value is where this set shines. 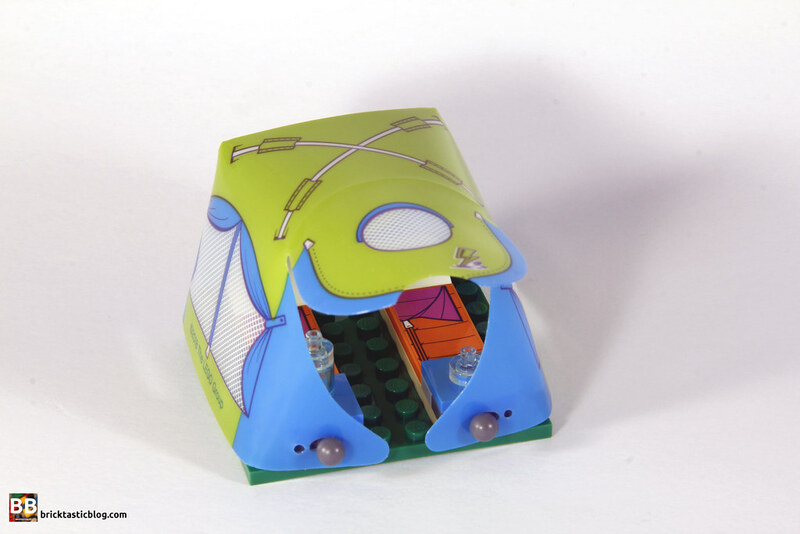 I’ve had a number of kids come and play with this set, including my 1 and a half year old daughter, and they’ve all been completely engrossed in it, playing with all of the different aspects of it. Even when I’ve tested it out and only given them the RV, it’s been extremely engaging. From that point of view, it’s definitely worth the money. From an adult collector’s perspective it might not rate as highly, but it’s still a good set that’s worth picking up. If you see it at a discount, then add it to your trolley! 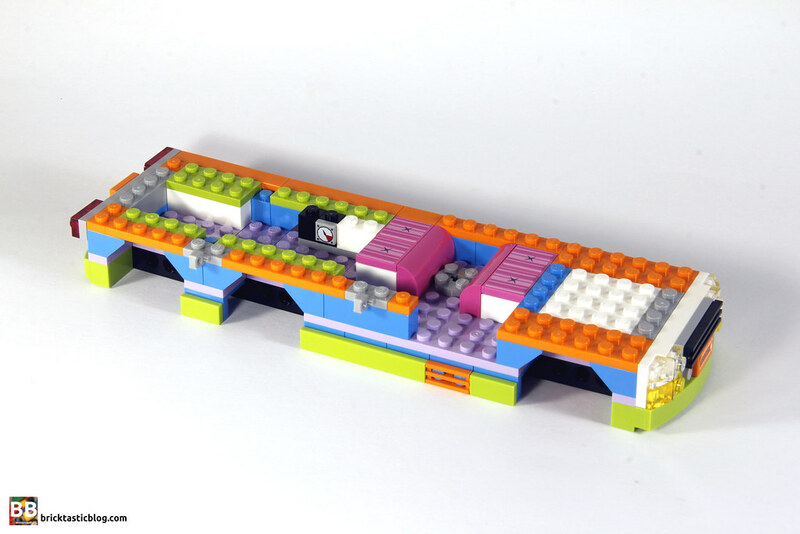 There are some excellent inclusions here, in a set that doesn’t have a matching version in LEGO’s history. 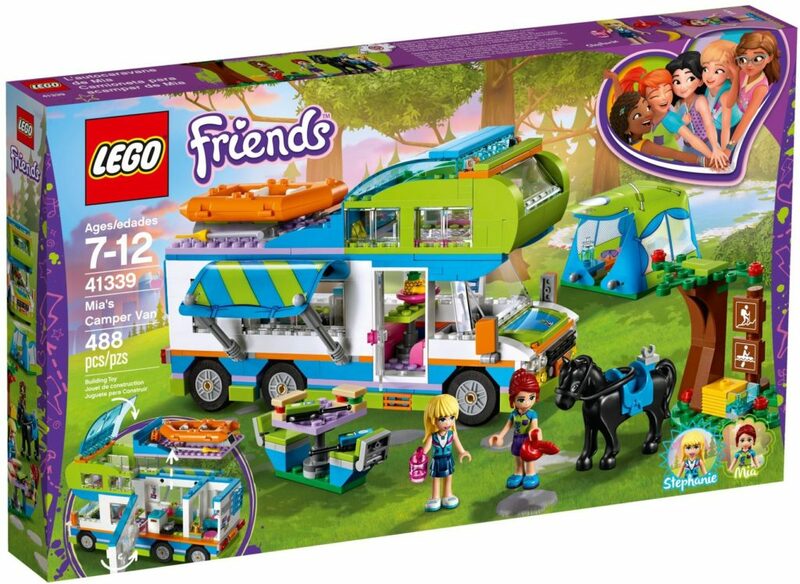 It’s big, has some quality elements included, such as a unique tent, a Friends horse, and more. If you like Friends, this is definitely one to add to the collection. It’s a quality set that’s likely to fetch a stable price after it’s retired.